A member of two USA teams in 2011 and an All-FIBA U19 World Championship Team honoree, USA Basketball today announced Breanna Stewart (Cicero-North Syracuse H.S./North Syracuse, N.Y.) as the 2011 USA Basketball Female Athlete of the Year. A member of the gold-medal winning 2011 USA U19 World Championship Team that competed July 21-31 in Puerto Montt, Chile, Stewart also played for the 2011 USA Pan American Games Team that competed Oct. 21-25 in Guadalajara, Mexico. Additionally, USA Basketball will nominate Stewart for the U.S. Olympic Committee’s 2011 SportsWoman of the Year, which will be announced in 2012. The USA Basketball Board of Directors is responsible for selecting USA Basketball’s annual award winners. As the second youngest member of the 2011 USA U19 team, Stewart started in three of nine games and in just 19.9 minutes per contest, averaged team-highs of 11.2 points, 7.3 rebounds and 1.7 blocks per game to help the USA to an 8-1 record and gold medal at the 2011 FIBA U19 World Championship. Shooting 46.8 percent from the field (36-77 FGs), Stewart was named to the five-member All-FIBA U19 World Championship Team. She scored in double digits in five U19 games, including 21 points and 13 rebounds in the quarterfinals; 13 points and 13 rebounds in the USA’s opening win against Japan; 13 points as the USA defeated Russia; 12 points in a win over Argentina; and 15 points as the USA defeated Italy. Three times she led the team or tied for the lead in scoring, and she also led or was tied as the team’s top rebounder in three games. In the USA women’s U19 record book, Stewart lists third for blocked shots (15) and fourth for rebounds (66). Among all participants in the 16-team field, she ranked second in blocked shots (1.7 bpg. ), and 10th in rebounding (7.3 rpg.) and defensive rebounding (4.9 rpg.). She also contributed 11 points, seven rebounds and five blocks to help the USA top Brazil 49-37 in an exhibition game on June 5 at the ESPN Wide World of Sports Complex at Walt Disney World Resorts in Orlando, Fla.
As just the second U.S. high school girls basketball player to represent her country in Pan American Games history, Stewart was the only high school player on the 2011 USA Pan American Games Team, which included 11 collegiate athletes. Starting in all four games, Stewart led the team in scoring (15.3 ppg. ), rebounding (11.3 rpg. ), blocked shots (1.8 bpg.) and minutes played (27.8 mpg.) to help the USA to a 2-2 record and seventh-place finish. She shot 50.0 percent from the field (19-38 FGs) and 88.5 percent from the free throw line (23-26 FTs). 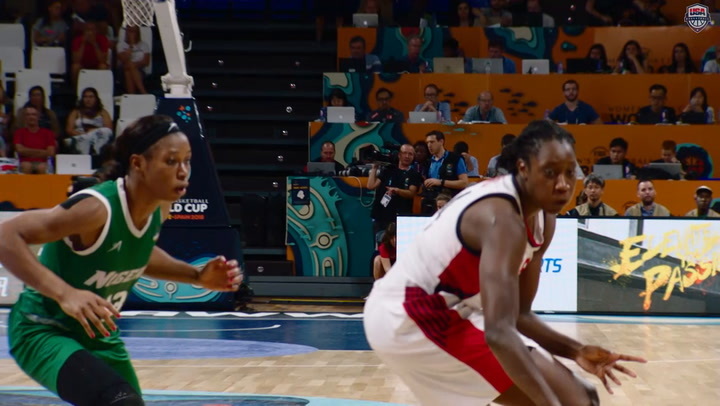 She led the USA Pan American Games team in scoring three times, recorded double-digit scoring in all four games and led or tied for the team lead in rebounding twice. Stewart compiled 18 points, four blocked shots and a U.S. Pan American Games record 21 rebounds in the USA’s opening game against Argentina; followed by 14 points and 11 rebounds against Puerto Rico; 17 points, seven rebounds and three assists versus Mexico; and 12 points, six rebounds and three blocked shots in a rout of Jamaica. Stewart lists second in the U.S. Women’s Pan American Games Team record book for blocked shots (9), third for rebounds (45) and fourth in free throw percentage (.885). Among all participants in the 2011 Pan American Games eight-team field, Stewart ranked first in free-throw percentage (.885) and blocked shots (2.3 bpg. ); second in rebounding (11.3 rpg.) and defensive rebounds (7.5 rpg. ); third in field goal percentage (.500) and offensive boards (3.8 rpg. ); and fifth in points (15.3 ppg.). As a junior at Cicero-North Syracuse High School in 2010-11, she led her team to a 22-3 record, the New York Section 3 and New York Class AA state titles. Starting in all 25 games, she averaged 24.3 points, 11.5 rebounds, 3.0 assists, 2.8 steals and 4.2 blocks per game. Thus far in 2011-12, she has helped her team to a 12-2 record as of Jan. 26. 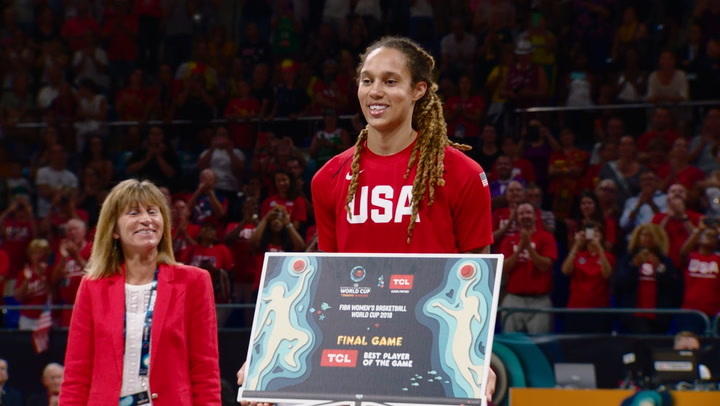 The USA Basketball Female Athlete of the Year award has been earned by an impressive list of athletes since it was first given 30 years ago, including Diana Taurasi (2010, 2006), Tina Charles (2009), Katie Smith (2008), Dawn Staley (2004, 1994), Seimone Augustus (2003), Lisa Leslie (2002, 1998, 1993), Teresa Edwards (2000, 1996, 1990, 1987), Chamique Holdsclaw (1997), Cheryl Miller (1986, 1984), Lynette Woodard (1983) and Carol Blazejowski (1980). Since 2008, USA Basketball men’s and women’s teams have compiled a sterling 134-6 win-loss record in FIBA or FIBA Americas competitions. 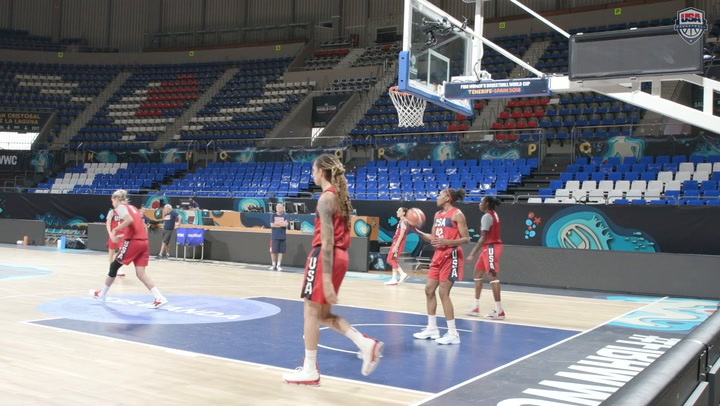 USA teams are the current men’s and women’s champions of the Olympics and the FIBA World Championships; FIBA women’s U19 world champions; the men’s and women’s title holders for the FIBA U17 World Championships; and the men’s and women’s U18 and U16 FIBA Americas champions. USA Basketball currently ranks No. 1 in all five of FIBA's world ranking categories, including combined, men's, women's, boys and girls.